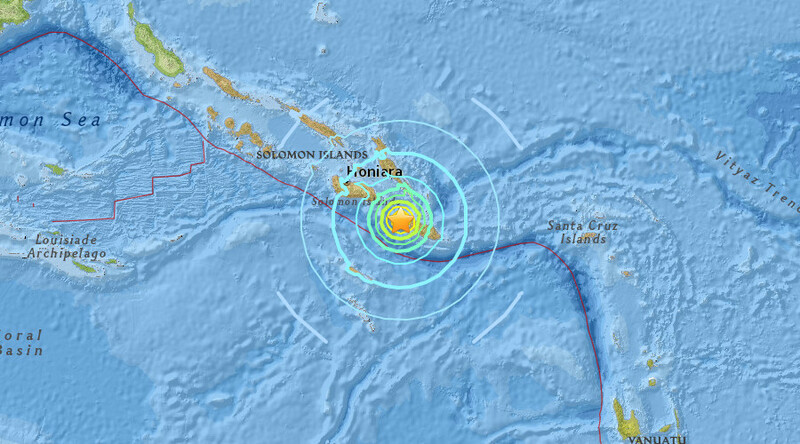 An earthquake measuring 6.5 magnitude on the Richter scale has struck west of Solomon Islands at a depth of 30km, according to the US Geologic Survey. The earthquake‘s epicenter was located some 67 kilometers from the town of Kirakira, the capital of Makira-Ulawa Province in the Solomon Islands. The quake was initially measured at 6.8 magnitude , but later revised to 6.5. No Tsunami warning has been issued by either the Pacific Tsunami Warning Center or the emergency services of Australia and New Zealand. Solomon Islands sits on an earthquake prone zone of the Australian plate. It is one of the most seismically active areas of the world because of constant convergences between the Australian and Pacific plates. Since the beginning of 20th century there have been fifteen earthquakes measuring 7.5 in magnitude or higher.